« Fall Migration is Underway! The 2010 New Jersey bald eagle nesting season has ended and the young eagles have left their nest areas and are heading out on their own. 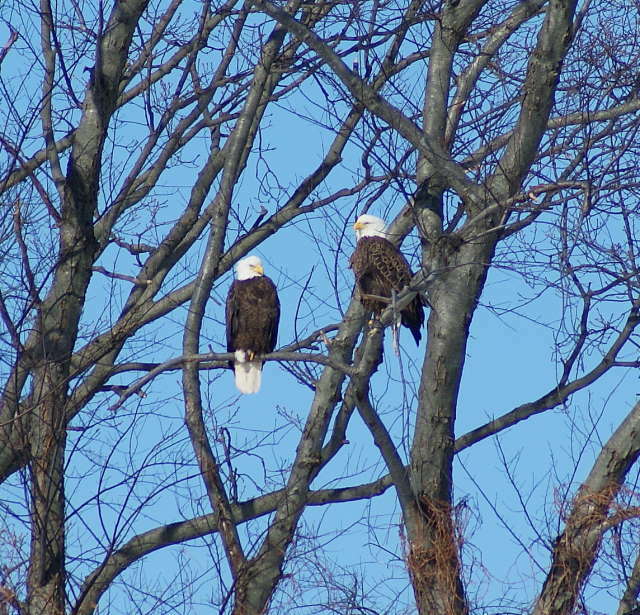 This season there was a high of 94 eagle pairs being monitored. Eighty-two of these pairs were active (laid eggs), 8 were territorial and it was unknown if and where 4 other pairs were nesting. Thirteen new pairs of eagles were located this season. Good news, the bald eagle population is increasing. Forty-three nests were successful in producing 69 young, for a productivity rate of .84 young per active nest. This is slightly below the required range of 0.9-1.1 young per nest for population maintenance. Unfortunately there were 32 nests which failed to produce young this season. Many of the failures can be attributed to the severe winter and spring weather which coincided with the eagle nesting season. But every population has fluctuations so this one off season won’t effect the NJ eagle population in the long term. More details will be available in the Annual Bald Eagle Project report which will be out by the end of the year. This entry was posted on Saturday, September 11th, 2010 at 8:00 am	and is filed under Volunteer Programs, Wildlife Protection. You can follow any responses to this entry through the RSS 2.0 feed. Both comments and pings are currently closed.